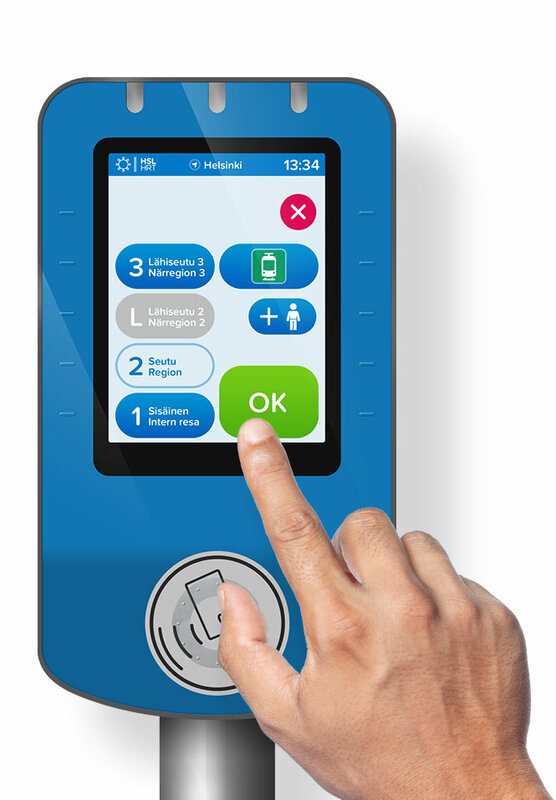 One of the most noticeable elements of the reform are the modern, touch-screen Travel Card readers. In addition, new ticket machines are introduced. Single-ticket machines are installed on trams. In future, displays at stops and the Journey Planner will display all vehicles in real-time. The new touch-screen card readers are easy to use. The card reader buttons are the same as before and you can buy all the same tickets as before. Only the 0 button, i.e. tram ticket, has been replaced by a picture of a tram. As before, if you have a season ticket, you only need to show your card to the reader. On the new reader, the reading area is at the bottom of the reader. By contrast, buying a value ticket differs from the present. First you select the travel zone (desired ticket) and then confirm your selection by pressing the new OK button. In the end you show your Travel Card to the card reader. Use the virtual Travel Card reader available on this page to see how the new card reader works. The new Travel Card readers have been installed so far in over 1,100 buses, 130 trains and 90 trams. The works will be completed in autumn 2017. Until then, there are both old and new card readers in use. 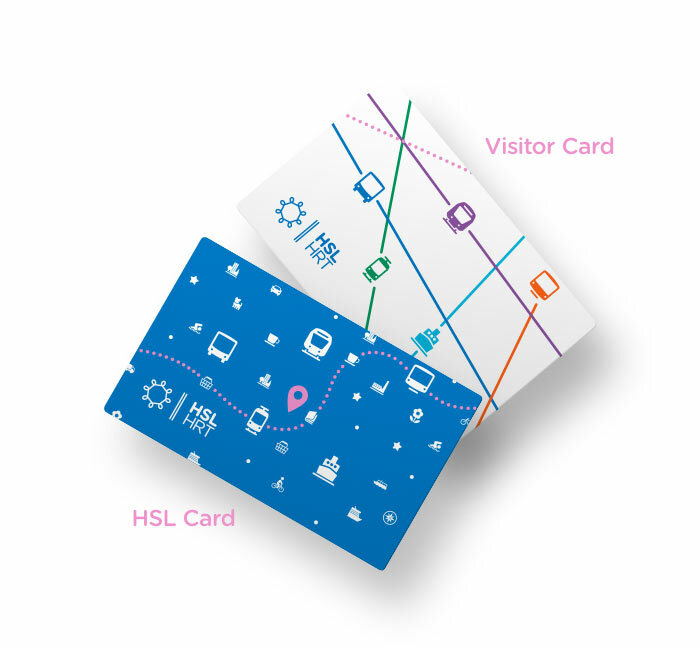 HSL will also introduce a new zone model but the transition to the new model will not take place in the first phase of the ticketing and information system reform. The new zone model will be introduced in 2018, once the reform is otherwise completed and Travel Cards have been changed. At this stage, a new user interface for card readers will be introduced (A, B, C and D buttons). Easy to buy value tickets. Confirmation with the OK button minimizes accidental button pressing. Works with gloves or mittens on. Can be installed outdoors and indoors. Selections are confirmed with the OK button. The way a fare is paid differs from the current system: first you select the travel zone (ticket), you confirm the selection with the OK button and show your card to the reader only at the end. When paying a group fare, the total number of passengers must always be selected. A possible season ticket of the payer is taken account of automatically when the card is read. The new touch-screen ticket machines guide users through the purchase. As the user interface of the ticket machines resembles those of the other new devices, it is easy to learn to use. The machines are blue and white. In future, you can top up your Travel Card at any full-range ticket machine. The machines offer a wider range of day tickets and they also sell single tickets. The new machines are introduced in phases during summer and autumn 2017. The machines accept cash, debit and credit cards and Travel Card value. The single ticket machines sell single tickets and one day tickets. The machines cash, bank cards and contactless payment. Travel Cards will also be changed. The change of cards will begin in 2018 once all card readers have been changed. The cards will get a new look and new names at the same time. 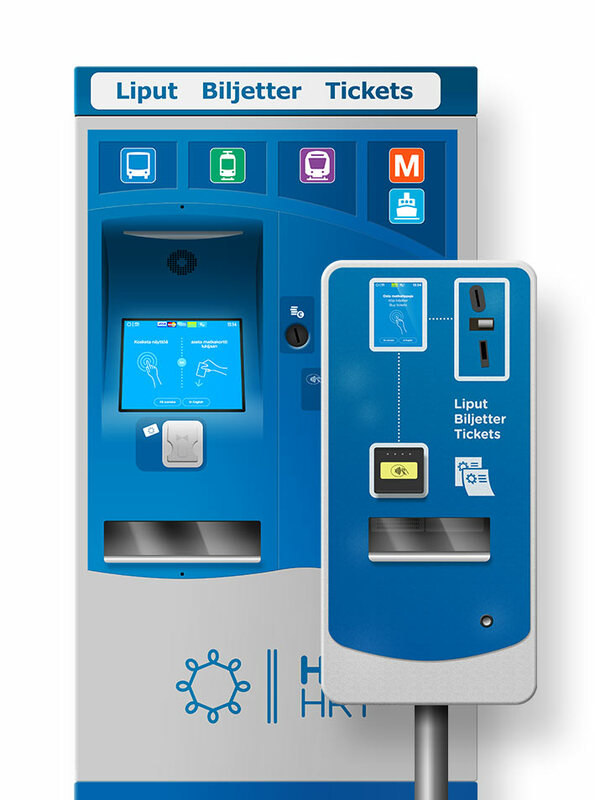 Travel Cards will be replaced by blue HSL Cards, single-charge cards by white Visitor Cards. Cards will be changed conveniently when customers top up their cards at sales points. The change of card is free of charge for a certain period of time. During the transition, both old and new cards can be used. The transition period is estimated to be six months. The new cards enable online top up and the introduction of the new zone model. The new information system significantly improves passenger information. Up-to-date information is available for all public transport vehicles in the HSL area. You get real-time information about the movement of vehicles before and during your journeys from displays at stops as well as from the new Journey Planner. In addition to vehicle movement information, the new system takes into account weather conditions and changes to these conditions. Displays at stops, stations and terminals display a vehicle’s real-time departure time from the stop in question. Passengers are going to get information about the next stop from audio announcements and displays to be installed on buses. Later the displays can be used for presenting information about diversion routes and passenger bulletins. Also applications provided by third parties can use the new real-time information (APIs provided by HSL). The name of the next stop is announced in Finnish and Swedish on all buses and trams in the HSL area. In addition, displays showing the name of the next stop are installed on all buses. At a later stage, audio announcements will be used also to inform passengers of diversion routes and other disruptions. There are in total 4,500 stops with different names in the HSL area. The audio announcements will be introduced simultaneously on all vehicles, once all devices have been installed approximately in late autumn 2017. The voice for HSL’s audio announcement was selected in spring 2015. Customers and experts participated in the selection. 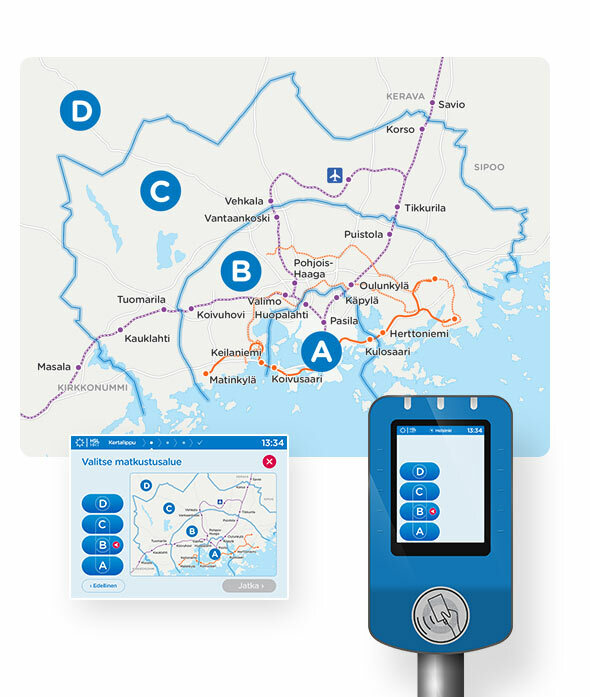 Along with the ticketing and information system reform, HSL has been developing a new Helsinki region zone model. The model is scheduled to be introduced approximately in 2018 once all new devices have been installed, Travel Cards have been changed to new ones and the entire information reform package has been completed. The boundaries of the new zones are primarily based on the distance from Helsinki city center. Unlike at present, the boundaries do not follow municipal boundaries, which enables flexible extension of the ticketing system. The Executive Board of HSL decided the zone boundaries in June 2012. The zones are designated by letters A, B, C and D. Within the metropolitan area (Helsinki, Espoo, Vantaa and Kauniainen), the minimum purchase is two zones. In other words, if you travel within zone A, for example, from Pasila to Helsinki city center, you will need an AB ticket. The zone model can be extended to new areas. The shift to the new zone model will mean changes to the card reader and ticket machine buttons. WHAT CHANGES WITH THE NEW ZONES? Pricing will be based more on the distance travelled. Short journeys across municipal boundaries will be cheaper. The minimum purchase in the ABC zone is two zones, i.e. you will be able to travel in a larger area with the same price. New zone extension tickets will be introduced. If you have a season ticket for zones A and B, you can travel to zone C by paying the zone extension fare rather than the full ABC fare. New value tickets for senior citizens will be introduced: senior citizens will get a -50% discount during quiet times 9am-2pm. Student tickets are issued to 18-29 years old students permanently living in the HSL area as well as to foreign exchange students. The student discount will remain unchanged at 50% of the adult fare. Age limit for children’s ticket will be raised by one year. In future, HSL can extend to new municipalities without major changes to the system. Electronic displays at stops and terminals are not a new thing, in particular in Helsinki. Now displays are installed also in other HSL municipalities and at the same time, old LED displays are replaced by flat color displays that resemble flat screen televisions. Thanks to the new information system, the displays will provide primarily real-time information, i.e. times when the bus or tram should actually leave from the stop in question. Displays are installed at the busiest stops. The smallest displays are black-and-white one-row displays. The displays show the route number and destination of the approaching vehicle as well as the remaining waiting time. Color displays or yellow LED displays are installed at the busiest stops and terminals They display the remaining waiting time in minutes if there is less than 10 minutes time remaining. In other cases, the departure time is displayed showing the actual time the vehicle will arrive. In some cases, there is a tilde (~) before the minutes or time. This means that real-time information is not available for the approaching vehicle but it should be on its way. In this case, the time displayed is the same as on the printed stop timetables. Unfortunately, it is not possible to install electronic displays at all stops. But where there are no displays, HSL’s Journey Planner is there to help.